Quote Me Inspirational Quote & Scriptures written and published by Author Michele L Benson. In this book, you will find quotes and messages that I've written down through the years until now. 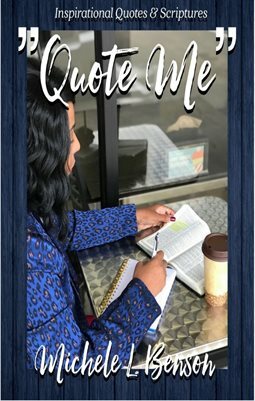 Each quote inspired by personal testimonies, random thoughts, Bible Study, and through prayers. You will find quotes about Life, Love and Faith in God. Also included in the book are most of my favorite scriptures at the top of each page. Thanks so much for your support! Be Blessed Loves, Michele Benson.